Bonding with the Baby After Surrogacy - Kinsey Law Group, P.C. The day when you will meet your baby is coming closer, and you’re probably thrilled, anxious, and excited all at once. Occasionally, you may feel a little envious of the surrogate who has had the opportunity to carry your baby for nine months, feeling those little kicks and hiccups. After all, most mothers start bonding with their babies while the babies are in the womb. You haven’t had that opportunity, so you may worry about bonding with your little one after he or she is born. If you’re nervous that you won’t form a deep bond with your baby, check out these tips for creating that emotional connection. First of all, give yourself a break. Even mothers who carry their own babies worry about the bonding experience. 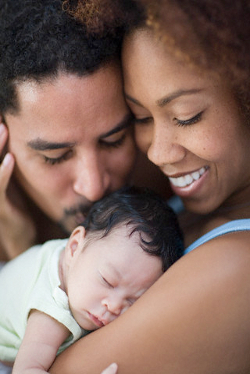 Some mothers and fathers bond with the baby immediately, while others don’t feel a deep emotional connection for a few weeks. Every parent/child relationship is different, and it’s all right if it takes a while to develop the bond. Meanwhile, there are many things you can do to help that relationship deepen and grow. Studies show that skin-to-skin contact helps babies regulate their breathing and body temperature and control their blood sugar better. Spend plenty of time with your baby snuggled up on your chest or in your arms. Tilt your head so that your cheek rests on your baby’s soft little head. Touch your baby’s arms and legs, and curl their little fingers around your finger. Whether you are changing your baby’s diaper, feeding your baby, or rocking your baby to sleep, make eye contact. Smile at your baby, even if you are tired. Look deep into that little one’s eyes. Speak in a soft voice, or even a whisper. It doesn’t matter if what you say makes sense; after all, you will probably be too worn out during those first few weeks to string together coherent sentences. Just be there with your baby, and let him or her hear the loving tones of your voice. Another way to grow the parental bond is to wear your baby. Do some research on baby carriers and wraps to find one that fits your body structure, lifestyle, and preferences. Once the baby is old enough to be safely secured in the wrap or carrier, spend time carrying the baby around with you as you do small tasks in the home. When you go out, use the carrier or wrap instead of a stroller. The carrier brings the baby up close to your face and promotes eye contact. The baby can also listen to your voice, feel the warmth of your body, and enjoy a feeling of safety and security, no matter what else may be going on. Doctors recommend against having the baby with you in your bed; you could roll over on the baby or accidentally move blankets or pillows onto the baby, causing suffocation or other harm. Instead, keep the baby in a co-sleeper or bassinet right near your bed. You’ll be within arm’s reach so that you can easily check on the baby during the night. Babies and little ones thrive with an established routine. It may be tricky to settle into a routine for a while, but do your best to have semi-regular times for feeding, bathing, diaper changes, awake time, and sleep. When your baby settles into that rhythm with you, both of you becomes more confident in your role as provider and caregiver. You may not even notice it happening, but one day you’ll realize the full power of that special bond between you and your baby.